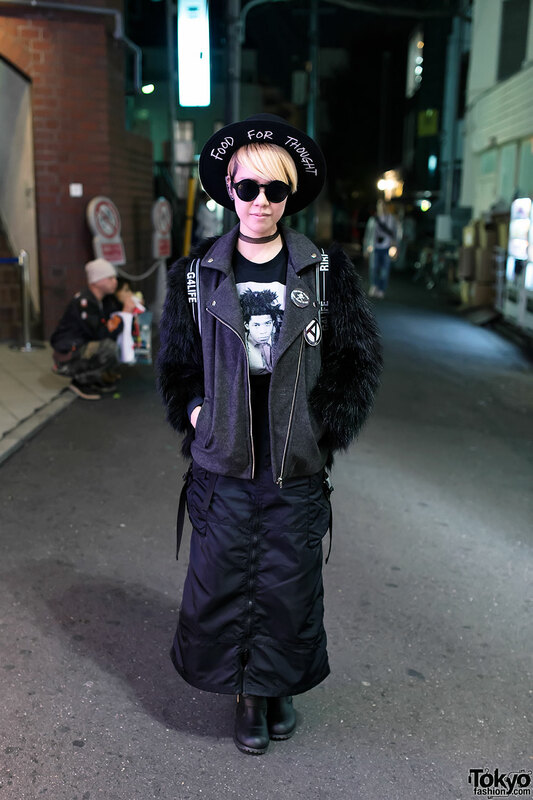 Itazura Tokyo staffer on the street in Harajuku after dark wearing a colorful graphic setup from Galaxxxy with a fuzzy hat, Joyrich jacket, and Milkboy bag. Harajuku girl with green streaked hair wearing a “NY” bucket hat with a Stussy t-shirt, an Adidas bag and Docs. Harajuku decora with colorful hair and fashion, and lots of Kuroko’s Basketball accessories. 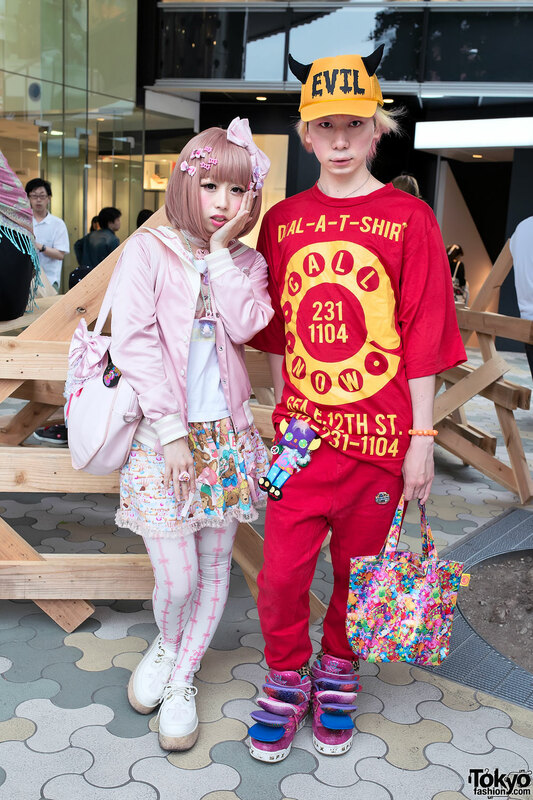 Harajuku girls in matching looks featuring twintails, sailor collars, Yusuke Hida sweatshirts, pleated skirt & loafers. Harajuku student with a pastel look which features a tulle skirt, hoodie, lace tights, and wedges decorated with bows and flowers. Japanese artist Choco Moo on the street in Harajuku with an Override x Choco Moo hat, Jean Michel Basquiat top & G4Life backpack. Harajuku student with cute twin-tone hairstyle, resale fashion, and kawaii heart & teddy bear backpack. 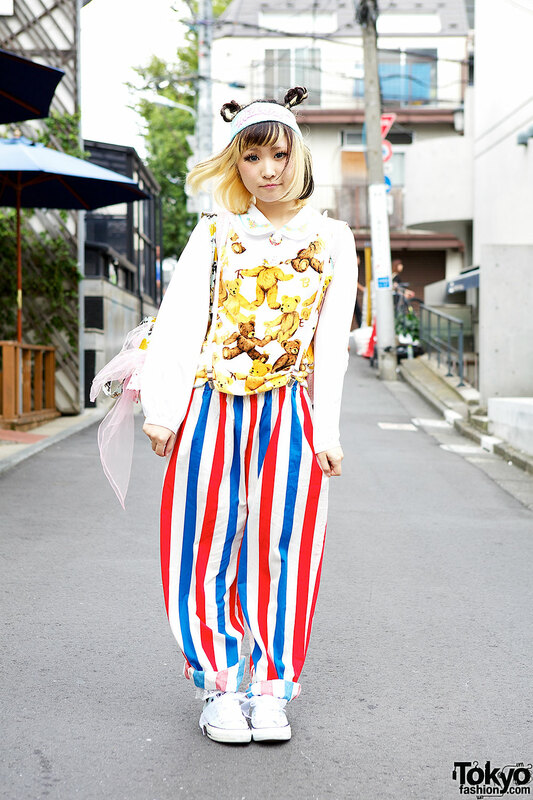 Nadia Harajuku staffer with yellow twin braids hairstyle wearing a Simpsons shirt with suspenders & sneakers. Kawaii Japanese comedian Haruka w/ Nile Perch & pastel and Junnyan w/ SPX sneakers and “EVIL” cap in Harajuku.